We canned most every night this week. Largely because I ran across some lovely fruit. A small box of seckel pears, some blood oranges, some cara cara oranges and nice fat lemons. 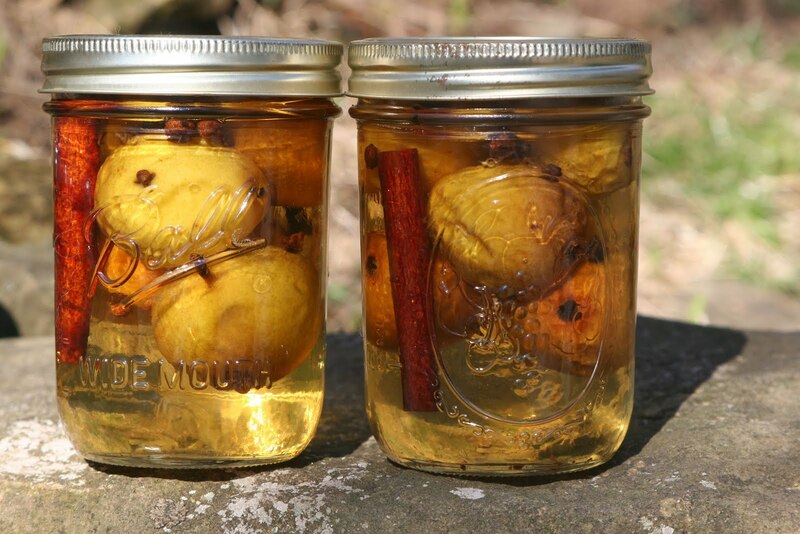 The seckel pears were spiced and canned whole. My preference would have been to peel them, but time was of the essence and after eating several of them, they were canned whole. While the nice sweet and bitter contrast of marmalade is my favorite and the Blood Orange and Tangerine marmalade was beyond wonderful, I had been thinking for some time about experimenting with a "meat" marmalade. Not one with meat as an ingredient, but with a bold, hot and spicy flavoring to add to meat. A little jar of marmalade could be used as a glaze, or as a condiment, or an ingredient. I made two varieties. 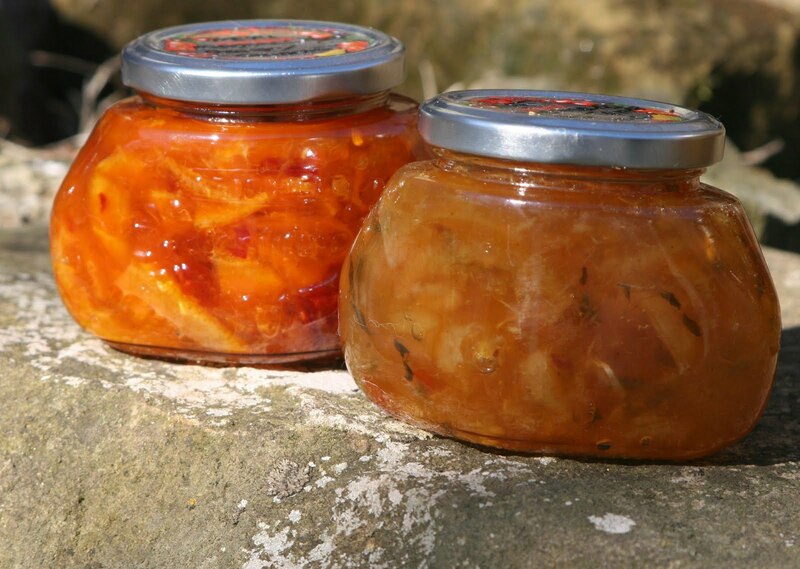 One was a Cara Cara Orange and Chipotle Marmalade. It was very hot and spice. i was thinking of using it with pork. I used it on chicken and it was very good. I also added a bit to a side of rice which made for a striking sticky, hot rice dish. A tablespoon or two added to a plain ketchup makes a barbecue sauce. I am still experimenting. 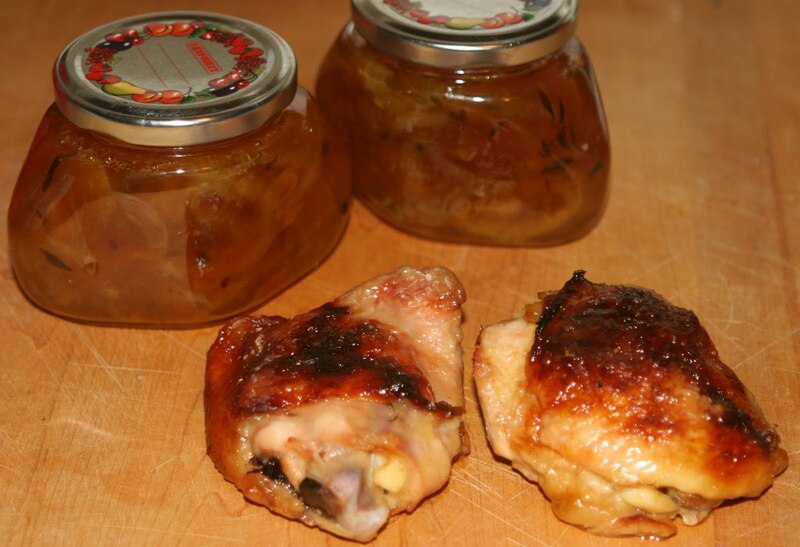 The other "meat" marmalade was an experiment for chicken. I made a Lemon, Thyme and Garlic Marmalade. This one was not as spicy as the chipotle, but the flavors came through. I tucked a teaspoon under each chicken thigh and baked. Since the marmalade has a high sugar content, one does have to watch that they don't burn, but I would say, the experiment is working well. I come over from Jeanie’s blog. I am pleased that you mentioned how good the blood orange and tangerine marmalade was. I am planning to make some orange marmalade and did not know which oranges to use. The International Market sells “sour” oranges and they are very sour – that might make a good marmalade too. We have a fig tree and I make a lot of fig jam every year. i have only one thing to say - yummee!! First, I am ever so jealous that Vagabonde has fig trees! Thanks to montana channing for the "yummee." Here's and update. The pears began soaking in their liquid and have been wrinkling up. The "meat marmalade" got a great responses but unfortunately, no one put it on meat they just ate it right from the jar!